"Low cost temperature compensation focusing"
If you own a motorized focuser and are tired of having to refocus because of temperature changes, then this software is for you. Telescope tubes expand and contract with temperature changes. Even though the movement is slight, the optimum focus point is extremely sensitive to these changes. TComp will monitor temperature changes and automatically refocus your telescope so it remains precisely focused all night long. The expansion is extremely linear for most equipment which means that once the motion per degree of change is established, the focus change can be applied for a wide range of temperature shift. After starting the software and selecting your ASCOM-based focuser, focus your telescope with your Bahtinov mask or another method which ensures precise focus. Add the focus point and then wait for the temperature to change by at least 3 degrees. Add the 2nd focus point. 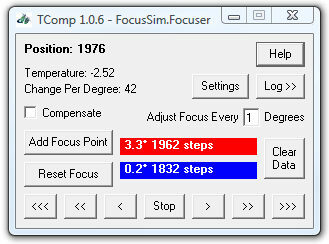 Click on the 'Compensate' checkbox and your focuser will now adjust for temperature shifts as needed.